Working parents of children aged 3 and 4 year olds could be entitled for up to 30 hours free childcare a week. Working includes employed persons, self-employed persons, and parents on zero hours contracts who meet the criteria. One parent is employed and one parent is disabled or incapacitated based on specific benefits. Eligibility codes issued to parents will typically have a 3 month validity period. Parents will be asked to reconfirm their eligibility on the GOV.uk website every 3 months, declaring any changes in their circumstances. Give childcare providers certainty that if they offer a free childcare place, they will not risk having an empty place immediately following those changes in circumstances. Once you have received your 30 hours code you need to check/validate your code by clicking here. You will then have the option to send your code to the childcare provider/school of your choice. Click here to see 'How Parents Can Access the Childcare Service. Click here to see 'A Parent's Journey For 30 Hours Free Childcare' diagram. 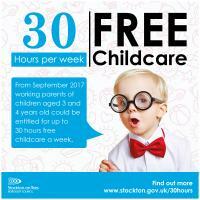 Click here to see Frequently Asked Questions about 30 Hour Free Childcare. If you have any issues or difficulties with your online application please contact HMRC direct on 0300 1234 097.